Today has been a day of well deserved rest. We made our usual garden visit first thing this morning, but then Mountain Man and I did our own things, a little bit of this and a little bit of that. We decided to eat a light fruit and nut lunch while dipping our feet in the cool flowing creek water, as it was another scorcher, 96 degrees (though I have to be grateful for that because there are places over 100! ), and to pan for gold, one of our favorite pastimes. We haven't panned for gold in a long time and today was a perfect day to do so. We bought the bag of gold ore we used today at the Crisson Gold Mine (we keep a big bag in the basement). We filled a coffee can with the gold ore and brought it along to the creek with a gold pan, tweezers, a small jar to put our gold nuggets into. After eating our lunch and soaking our feet, we moved to sit on a couple of rocks along the creek at a spot that had a small pool...let the panning begin! ...and repeat this process until the gold ore is gone...we found a total of 6 nuggets today, not bad! Have you ever tried gold panning? Have you found gold? After visiting the garden (morning routine), we got to work. The photo below is early this morning. Our first steps...Johny had to replace some rotten wood on the outhouse before we could begin the splitting & stacking wood process, and I had to prepare the ground for the pallet we would be stacking on. Then we began splitting. It didn't take long and we were stacking! This is the splitter working, an amazing machine and very grateful to get to use it! I'll have you know that today Mountain Man was much more comfortable & knowledgeable of the process and not longer stood behind the wheel, LOL! I decided that it would be a great idea to burn all the bark we were getting off the logs. We have a small fire pit right near where we were splitting, so it seemed logical. Of course, I did not begin this burning until early afternoon, the warmest part of the day, so the heat from the burning remnants did not help with the heat. But I was happy with how clean things were when we were done, ha ha! And note the water in the background...safety first! After splitting most of the logs, we had to put a log next to the stack in order to be able to reach the top and stack some more logs! We finally reached the point that we could stack no more! Though there is some wood that is touching the outhouse, that is due to settling; we did stack the wood with space in between. But we had to finish the job! And since we were returning the splitter to Charlie tomorrow morning, we decided to put all our dwindling energy into continuing to split until every log was gone (of those we had selected...there are still about 75 more logs behind the outhouse to go), and just throw them in a pile, organize tomorrow (from previous posts, you may presume this was not my favorite thing to do, but I was so tired, I just wanted to be done!). The very last log, which was the largest, was 21" in diameter, 66 1/2" in circumference...so heavy! We were so tired we did not want to risk trying to lift it, so Mountain Man used his manual tools to make an initial split...and then we could lift it to the splitter. If we had to cut each and every one of these logs this way, we would never make any headway! While we are working on living off the land, I sure am glad there are some tools like wood splitters to help along the way! I'm off to the creek, my feet will thank me! Or at least we are on our way! Our good friend and neighbor Charlie is letting us borrow his wood splitter (he made it himself!) for a couple days, so we can cut some logs that are too knotty for Mountain Man to cut with his ax/maul/hatchet/sledge hammer, whichever combination gets the job done but can't get the job done because the wood won't cooperate. So today and tomorrow you can call me Lise the Wood Splitter! While we were preparing for the job, I came across these three pieces, which made me laugh out loud. The artistic and humorous part of me will not allow them to be split. These will be turned into something creative, though I don't know what yet. I thought you would appreciate seeing them! To me, the one on the left in the first picture below looks like planter/vase potential or a nook & cranny to put stuff into, the one on the right a pair of legs with zipped pants, maybe a table? The second photo piece of wood looks kind of like, well....never mind...I'll let you use your imagination! Back to business, Charlie delivered the splitter last evening; the passenger is his grandson Liam (great name:) and very nice boy! Liam is visiting with his sister and a cousin up here in the mountains for a while. I think he liked his ride! We got up early this morning, went to the garden to water, and then the wood splitting fun began. Here is the wood we needed to split...the first two photos are birch & oak mostly, stacked near the basement, and the third is lots of hemlock...(Yes, we know it is not good to burn lots of hemlock (due to the sap) but we will burn bits of it at a time.) The hemlock logs are the result of our having about 18 dead hemlocks around the cabin cut down 3 years ago. I will share more about this on a future post, but all the hemlocks in Western NC were killed because of a Eastern Hemlock Blight...so sad; I can only imagine how thick the woods today would be if these trees were still alive and well...the trunks still stand tall with the branches far outreaching...amazing trees! ...yes that is an outhouse in the background, no we don't use it (it is the pump house, ha ha). One does have to be careful though, the very first piece of wood we split was so hard is was snapped off the machine as it was split and as Mountain Man would describe it, "jumped right into my lap"...he was not a happy wood splitter for a few minutes, and though he did not double over, he did go check his merchandise! From that point on he stood behind the splitters big tire while splitting the wood for a while...no need to worry thought, he's OK and fully recovered very shortly after the incident! ...we were very pleased with our work, as each rack had some wood, but not like this. We still have much to cut, but this was a great days work for winter preparation! Tomorrow, we will split the hemlock. We moved a bunch of logs from around the outhouse in preparation of the splitting to begin tomorrow morning, of course we discovered a couple rotten boards on the outhouse so that will need to be repaired first, and while Mountain Man does that I am going to rake the rotten leaves and hemlock remains to put into our compost pit (all part of living off the land). After that I will begin splitting until he is ready to join me...I'll be sure to keep my privates away from jumping logs! A garden requires some work, some love, some knowledge (or learning as you go, as is mostly our case) and a great deal of patience. I've confessed before that patience is not something that comes naturally to me, and I find the wait part so looooong! Thank goodness there is the water and weed part that happens often in between! Not to mention the fungus, bug & bird control and other maintenance issues that must be taken care of. Speaking of maintenance, what do you think of my "living off the land" snow pea plant trellises? Made from small branches of trees we've cut, and some twine we had in the basement that I strung between two branches so the peas can climb with support. Let's see if my construction holds up over time! The squash and beans from our 3 Sisters Garden is sprouting. I love to watch the progress...this is one squash seed beginning the push through the soil, can you imagine the strength of this seed that is only 1/3 inch big when planted 1/2 inch into the ground? And this is the same seed sprouting through, reaching for the sun! I do have to admit, I do enjoy the process. Each morning, we walk to the garden and admire what we have. I am so grateful that we are living this life right now... It is true, patience is a virtue I continue to pursue, but it does seem the Universe is working with me! Life is good! A Day Like Today is what Makes Living in the Mountains Excellent! This has been a most perfect nearing the end of June day! 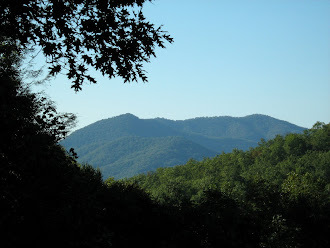 Reasonably low humidity, temp starting in the upper 50's, reaching a peak in the upper 70's and decreasing to the 70's as the sun is setting...better yet, the sky has been blue with nary a cloud in the sky, and the mountain breeze has been gently brushing my chimes all day. Excellence!!! This is our place today, it's a crooked picture, I know, but I have been wanting to update the picture on the header on front page of my blog, but that takes so much time, and I just want you to see where we are today, so forgive the crookedness, if you don't mind...it is not a reflection of the land or any recent earthquake activity (there has been some around here actually, nothing major, 1.7 or something, but there has been some)...anyway, our place, today, a day filled with excellence! The day has been filled with finding new growth in the garden (woo hoo) and discovering my sunflowers are sprouting (another woo hoo and even happy dancing), working in the woods to cut down overgrown brush with our new battery powered Ryobi weed eater (my new best friend, don't tell Mountain Man), finding new mushrooms in that process and eating them (more to share in a bit), moving wood from the chopped stack downstairs to the wood holder near our back door, baking a new desert creation (no recipe, just my ideas) that I will say was an excellent learning experience (not a disaster, but like Einstein, takes lots of tries before getting it right) so I am not sharing much about it today, discovering a new caterpillar climbing the walls, floors and beams that will soon become a Pipevine Swallowtail butterfly...so many things to share...sorry, I do believe this is a ruuuuun on sentence! I think of most interest to you will be the lobster mushroom we discovered and ate this evening, along with our Roasted Tomato and Goat Cheese Portobello Mushroom dinner, a recipe I got from my cousin Mitch's Pinterest pins, a delicious, fulfilling vegetarian meal I would highly recommend. PS, we are no experts, so you are on your own with eating wild mushrooms, look to those who know before ingesting!!! My Dad is new to the whole blogging world and doesn't really enjoy complicated Internet activities. However he has been commenting on my posts via email almost each and every day, which I have been appreciating tremendously. When he was here for a visit recently, we spoke about how to post comments, and he said he was committed to figuring out how to make it happen once he returned home from vacation. Persevere he did, and today, I had my first comment from him on my blog rather than an email. It made my day! While he was visiting (I have several posts about it), we passed by a waterfall on the road leading up the mountains toward our cabin. It is a well kept secret, set far back from the road. One day, as we passed by, and I pointed it out to him and Donald, he wanted to take a picture. It was 3:19pm, and the sun was just exactly right, shining on the water at just the right angle, causing it to sparkle and shine while targeting the water specifically (rather than the trees and brush surrounding it). So we stopped in the road (there is no turn off opportunity or curb) so he could snap the shot. Of course, as things happen, a car approached, and we had to move on. We tried several additional times to capture that scene, but the timing of the sun hitting the falls never happened in the same way. He kept joking about how that moment would be a mere memory! So being the loving and dedicated eldest daughter that I am, who loves her father/daddy/dad/friend/teacher/mentor dearly, has been trying to capture the moment again. ...not quite the same as being there, and not taken at 3:19pm, but I think it captures the feeling. I will never again pass that waterfall without thinking of you! I made my first strawberry jam yesterday, thanks to The Garden of Eating blog strawberry jam recipe. I won't go through the recipe itself, because you can click on the link for the details and Eve's delightful blog. This was my first foray into "jamming" with fresh whole fruit, and though it was not really difficult, there were some challenging moments. But the end result was absolutely scrumptious strawberryness on my ciabatta toast for breakfast. Oooh yeah! Eve's jam instructions are excellent, and make the process easy to follow. The first important step is macerating the fruit. That means mixing the cleaned strawberries with sugar and letting it "steep" overnight so the fruit becomes saturated with the sugar, eventually drawing out all the natural sweetness to make a sweet, syrupy strawberry bowl of goodness. Then you have to sterilize your jars, lids and seals in boiling water. I actually used 8oz. jars rather than the pint size Eve suggests. This step makes for a very steamy kitchen (I used 3 pots filled with jars). I recommend you sterilize 1 or 2 more jars than you think you will use, because you don't want to find yourself with jam ready to jar and no jar to put it in! This is the stage I begin gathering my ingredients...and as my father would say, taken from the Bernstein Bears series, "let this be a lesson to you"...make sure you have a sufficient supply of all your ingredients prior to planning your "jamming"...otherwise, like me, you will have to make an unexpected run to the store, that is after begging the neighbors, which I don't have many, if they might have what I needed, which unfortunately, one did not and the other was not home. So off I ran to the store for pectin, pectin of all things!, can't make jam without pectin, and I needed 1 1/2 TBSP more than what I had. The unexpected plus and awesome thing about this side trip was I met Mr. Grouse, a very handsome dude strutting his stuff on the road to our cabin. You can read more about Mr. Grouse in yesterday's post, just click here. I was finally back in business...ready to make the strawberry jam. In go the ingredients (I love how the berries are reflecting off the side of the pot in the photo below). I should add here that I did amend Eve's recipe by adding the zest of 1 lemon; when I made my violet jelly, I found adding a bit more than the recipe required resulted in a little bit of extra zingyness, so I decided to add that to this recipe as well. Once the jam reached the silky consistency Eve's recipe describes, it was time to pour it into the jars. Now that can be a tricky step, especially if you don't have a canning pot with a holder for the jars. At first I had too much water in the pot, so as I added the jars and the water would rise, jars would start tipping over! So with Mountain Man's assistance, we removed some of the water, and reorganized the jars into the pots. Now when I spoke to Bertie today about it, I was delivering their jar of sinfully scrumptious strawberry jam, she told me 1. "I told you you can borrow my canning equipment any time" and 2. "in the old days we used to use towels around the jars". "Thank you Bertie, you are sweet and I know you said I can borrow those things, and ha ha, what a great idea, I will use towels next time if I need to!" I did finally get the jam into the jars with the seals and lids on, and soon enough all the jars were in the boiling bath for 10 minutes. Here is the coolest thing, and Eve mentions it as well. When the jars are set on the counter to cool, you begin to hear the pop of the lids as they seal...it is the most beautiful sound. Each time I heard it, I would giggle and clap and say "woo hoo" and do a little dance in the kitchen...when you hear that sound...success!...jam that is sealed and will last about a year! FYI, all my jars popped except for one, and I discovered the lid (the round part that twists shut) had a small dent, therefore the seal could not be completed. The good news is jars that don't seal will still last in the fridge for about 2 weeks. If you ever come visit, I promise to share some sinfully scrumptious strawberry jam with you if we still have any left, better hurry! Two Months In & I'm A Lumberjack!